Why do I love this group of Quick Ship furniture & Technology Products? Aside from the fact that many are GreenGuard certified, Made in the USA and/or with Green Manufacturing practices they ALL meet a balance of 4 important principles. Quick Ship, Design, Price & Function. Our product line is designed to ensure long-term end-user satisfaction. How? Furniture must provide end-user functionality. That’s the whole point of making a purchase – you want it to work! Our furniture is hand-selected so that you will use & enjoy your purchases for years of functional, versatile & reliable service – in style. As manufacturers for over a decade & Jim’s furniture design & engineering, we understand the VALUE of QUALITY design & materials. Quick Ship Picks: Click product names below for complete product specifications & photos or to purchase using our shopping cart. Comparable to Epoxy resin for extreme chemical, abrasion and stain resistance. The Phenolic Resin Science Tables are available in Black with beveled edges for comfort. 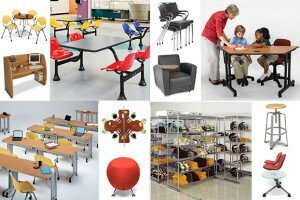 Round Stools for your Classroom, Art room & Science Lab Heavy duty steel Round Stools – Hardboard Seats from National Public Seating are constructed with 7/8″ O.D. 18 gauge steel tubing and masonite board seat tops. Great for any Affordable, heavy-duty stools are perfect for school classrooms, work shops, science labs and art rooms. Our Round Stools are available in 3 heights – 18″h, 24″h and 30″h. The Up-Rite Adjustable Height Sit & Stand Desk is a simple to use, ergonomic solution to add energy to your environment. Mobile and easily adjustable from sitting to standing, even for tall people, the Up-Rite Desk helps you Get Up, Stand Up™! The desk height adjusts from 26″h to 43″h allowing the desk to be used as either a sit down or stand up workstation, encouraging efficiency by letting you refresh your position in the office, classroom or training room. The Balt 34796 innovative Up-Rite Pneumatic Height Adjustable Stool is designed for use with a sit to stand desk or workstation. Get the versatility of standing while relieving the stress associated with being on your feet. Built from rugged materials, stool is designed for long-lasting performance in any environment, including industrial, educational, commercial, or medical settings. Pneumatically height adjustable from 28.25″ to 37.25″ for individualized comfort. Our 17 piece QUICK SHIP Mesa Series Training Room Furniture consists of Teacher Desks with Single and Double Pedestals, Training Tables with 2 Supply Drawers, Half Round Table, Mobile Locking Utility Station and Sales Tables all with a 16 gauge steel foundation and durable scratch resistant power coated paint finish. The contoured top panels allow tables to face one another with clutter free cables flow. Our Study Carrels provide ample room for study, test taking and research with a roomy desk top and pull out shelf for a laptop, tablet or keyboard. Start with a Floor Carrel to start a row, and then join as many Add-A-Carrels as you need to complete the desired number of study spaces in each row. The contoured side panels create pleasing arrangements while providing need privacy between workers or students. GREENGUARD GOLD Certified. 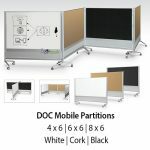 Versatile and multifunctional “DOC” Partition & Display Panels allow you to DIVIDE, ORGANIZE & CUSTOMIZE a work or display area however you choose. The Balt 27690 iTeach Desktop Tablet Charger can easily charge up to eight USB tablet or phone devices right on your desktop. The controlled power management knows which devices need more power, helping to extend battery life and saving energy. Includes four charge indicators and on/off power switch. Charge up to eight devices with one power cord to the wall. Mix and match your Tablets, iPads and Chromebooks in one attractive Mobile Device Charging Cart. This versatile Tablet Charging Cart or iPad Charging Cart, provides ample lay flat storage in 24 separate generous sized compartments with cable access from each shelf. See below for more convenient features. Our Laptop Charging Cart 24 Unit provides a common sense solution to protect, charge and secure your laptop computer investment. Attractive scratch resistant laminate and quality construction provides years of reliable service. Each generous vented compartment has cable management access. Anthro Tablet Carts – Wouldn’t it be great if you could keep the same tablet charging cart for years, long after your first generation of tablets? You can with our Tablet Charging Cart for iPads & Tablets. Its shelves shift up & down, its bay dividers move side to side. You’ll be able to fit tablet devices of all shapes & sizes in this innovative cart. You get to decide how it’s organized! Tech Tubs for iPads, Lock, Charge, Sync, it really is that simple. Tech Tub for iPads is a compact solution designed to support various mobile devices. Made from highly durable, heat-resistant ABS plastic and vented to ensure airflow, Tech Tubs are secure, mobile and lightweight. Tech Tubs support a “grow your technology” approach to purchasing. The VGA easy connect console and sliding shelf are designed to support all leading brand document camera and LCD projectors. Additionally this power house includes a storage drawer, a flip-up side shelf, an integrated pop-up lectern, ventilation, a mounted 6 outlet power strip and 25′ cord with winder. Everything you need in a lectern for multi media presentation organized and in reach. OFM’s E1001 Essentials Mesh Back Task Chair features built-in lumbar support and gas lift seat height adjustment to keep you comfortable. Durable mesh backing allows for plenty of air circulation. Height adjustment is easy with the gas lift, and the arms are also adjustable. The five-star mobile base provides support at all angles. The black fabric upholstery on the seat coordinates with the black mobile base. Rico Stacking Chairs 300 lb. weight capacity and best of all, it’s GreenGuard Certified for Children and Schools. Save manpower and protect your Chairs from wear and tear with our Rico Stacking Chair Dolly. Stack, store and transport your chairs quickly and easily on OFM’s 305 & 306 Series Chair Dolly. This steel dolly has four casters, making it a cinch to transport your chairs. 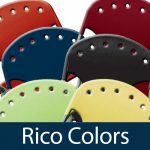 Holds up to 15 of your OFM Rico Stack Chairs. Save manpower and protect your tables from wear and tear with folding table dolly’s. Transport dolly’s facilitate efficient set up and tear down of your banquet room or meeting room. Each dolly holds up to 10 folded tables for easy transport and safe storage. Even if you have 6 tables, the dolly will allow you to transport them from storage to venue quickly and doesn’t require a second person to help carry them on or two at a time. Our Sliding Shelves are GreenGuard Gold certified & are available in 8 different sizes. The X5 Lite Sliding Steel Shelving Systems recover wasted floor space by turning aisles into more storage area. Shelving Units slide effortlessly on our exclusive, patented track system. Each shelf has an impressive 300 lb load capacity (even distribution). You measure – we maximize! Interplay fits perfectly into the “Social Seating” arena. Both the single tablet chair and double tablet sofa come in 4 coverings and color options including all PVC free polyurethane, AntiMicrobial and a combination of fabric and PVC free polyurethane. The swivel tablets are smartly finished in bronze and black wood grain laminates. The 500 lb. weight capacity welcomes everyone to enjoy it. Standard lockable casters keep them in pace until you feel the need to rearrange your space. Use the built-in handle at the back to easily move InterPlay around. Perfect for office lounge, reception, and guest waiting areas would benefit from this stool and multiple units can be nested in any configuration your space might need. This comfortable modern seating solution supports users up to 250 lbs capacity & ships fully assembled. Endurance means to have a lasting quality, to withstand and continue on. Our Endure Height Adjustable Stools have the industrial look and feel that is so popular in today’s interior designs and lives up to its name. Whether it be at the school, science lab or office. The Endure Stools look great in a University Cyber Cafe and adds a contemporary look in your modern kitchen. These stools look great and superior function. Choose the taller counter height range 25.75″- 34″ h or the desk height range of 17″- 25.5. The 360 degree turning capability makes height adjustment easy! Quick Ship: For when you “need it now”. Our Quick Ship furniture will generally ship within 24-48 hours. Price: The business office needs to purchase within their budget to hit an affordable “price point”. At Bakagain, we select furniture that is the best in their class at “entry-level, better & best” price levels. For example, our science tables top materials range from Hi-pressure Chemical Resistant (ChemSurf), Phenolic Resin to Epoxy Resin. An elementary school may choose to purchase Epoxy Resin because that is what most people picture when they think of science tables. Actually hi-pressure or chemical resistant laminate could be considered the “best” in terms of durablity & price because Elementary school stundents don’t use chemical agents that other surfaces guard against. Click here to read more about chemical resistant materials. Call Bakagain at (336) 701-2333 We are here to make sure you get the furniture products you need. We are happy to provide furniture specifications, quotations, photos to help you with your decision-making and purchasing requirements.